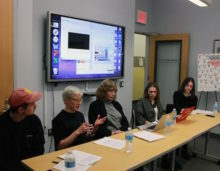 On December 9, 2016, the Jordan Center for the Advanced Study of Russia at NYU and the NYU Department of Russian and Slavic Studies held a panel discussion entitled “Falling Lenins: Decommunization in Ukraine through the Lens of Art,” organized by Natasha Bluth, Research Assistant at the Center and MA candidate in Journalism and Russian and Slavic Studies at NYU. The panelists were Vienna-based multimedia artist Anna Jermolaewa, NYU History PhD candidate Kateryna Ruban, CUNY Art History MA candidate Asia Bazdyrieva and Vova Vorotniov, a Ukrainian artist and activist. In her own introduction, Bluth noted that as the third anniversary of the Euromaidan Revolution approached, one of the most striking outcomes of the event remained the passage of a series of decommunization laws in May 2015, which criminalize both Nazi and communist symbols in Ukraine and outlaw “public denials of the criminal nature of the communist totalitarian regime of 1917-1991.” Since then, Bluth said, the authorities have removed over 1000 statues of Lenin and revoked the communist namesakes of over a 900 towns and villages. Bluth then invited the panelists to reflect on the meaning of these changes for Ukrainian politics, culture and particularly art. Jermolaewa showed an edited version of her film Leninopad, which was part of a larger installation in Vienna that includes photographs of toppled Lenin statues and an original, decapitated Lenin statue she bought in Ukraine. In the 11 minutes of the originally hour-long film, Jermolaewa visits more than 50 towns in Ukraine in search of the Lenin statues, most of which were recently removed. Engaging locals on what they think of the change, she finds differing answers, from support to indifference, sorrow to nostalgia. Ruban, whose Ph.D. thesis is an exploration of Soviet public healthcare through the micro-history of a small provincial hospital in western Ukraine, said that through her work, she aims to answer “what the Soviet state was in general,” a question that has been politicized once again after the collapse 25 years ago. “The decommunization law provides me with a moral framework that I follow in my research because of its reference to the ‘criminal nature’ of Soviet symbols,” Ruban said. She argued that the law made a caricature of the Soviet past in its implication that every aspect of Soviet Ukraine was imposed by the Kremlin. Rejecting the suggestion that Ukrainians were en masse resisting that system, Ruban’s work aims to show that Ukrainians actively worked to build a Soviet state and were not passive victims of Soviet rule. As an active participant of the Euromaidan Revolution protests, Bazdyrieva said she was “fascinated by how people use public space to communicate their messages, as well as what kind of messages communicated from above were passing through public space and art.” In her current research, Bazdyrieva said she is interested in identifying shifts in how people perceive public spaces during and after the revolution. She argued that whereas before the revolution, public space was not such a major object of discussion or attention, the revolution activated many areas as a way to engage more people in protests. Soon after the protests, more nationalist symbols replaced pro-human rights messages, followed by the government’s appropriation of Soviet symbols in public spaces. According to Bazdyrieva, Lenin became the focus of the tension for those Ukrainians who associate the European Union with democracy and the Soviet past with a system of authoritarian government. In particular, Bazdyrieva talked about an installation by Mexican artist Cynthia Gutierrez, shown on the spot in Kiev where the first Lenin statue was toppled in December 2013, and the public discussion it provoked. Gutierrez’s controversial work, a scaffolding with stairs allowing viewers to climb on top of the pedestal where Lenin once stood, elicited various strong responses. Some relished the chance to stand in place of the statue, others were horrified—in the Second World War, it served as a gallows where Nazis would hang Ukrainian partisans and the Soviets would later hang Ukrainian Nazi-collaborators. For Bazdyrieva, the plethora of experiences raised by the work and its invitation to acknowledge a complicated history stood out. “I’m interested in advocating for more of these projects so we can have more public discussions, so that we can acknowledge our conflicting past,” she said. Vorotniov, in his turn, started out by describing himself as a “hooligan” and “citizen veteran of two revolutions” and talked about his “naïveté” during the Orange Revolution in the winter of 2004-2005, when popular protests demanded a revote in the presidential elections. Unlike during the first revolution, when he had high hopes, Vorotniov was “extremely skeptical” during Euromaidan “from the beginning, even before it became really violent.” He said he is interested not just in a general view of “Lenins,” but also wishes to juxtapose contemporary culture of young people from Kiev and these monuments that are in danger of being demolished. “In my view, decommunization has already happened,” Vorotniov said, pointing to socialist monuments, which are some of the most common public spaces occupied by teenagers and used by skateboarders, a symbolically American activity. If the laws truly aimed to do away with the evidence of Soviet experience in Ukraine, Voroniov said, there are other [already decommunized] spaces that should have been targeted: Kiev’s Lenin Museum, now the Ukrainian House, the House of Parliament and People’s Friendship Arch, which symbolizes the friendship between Russians and Ukrainians within the Soviet Union. In passing these laws, “they are fighting with ghosts,” Vorotniov remarked. Bluth then intervened, bringing up the question of decommunization in the narrative of the revolution, asking participants about their views on how much decommunization was about creating a new Ukrainian identity by way of erasing the past. In Ruban’s opinion, the removal of Lenin statues in large cities and small villages is an imitation of the revolutionary moment. In the original act, revolutionary anger brought people to destroy monuments that stood as symbols of the old regime; in this instance, the removal comes from the government in a move to imitate that first moment. “In Kiev it can be considered genuine, but not in the hands of unknown people from right-wing parties that come in the night, who have nothing to do with the revolution,” Ruban said. To her, it is also important, within the understanding of what the Soviet past is, to see these different Lenins as belonging to a history of communal life. Rather than solely ideological symbols, these statues were part of a complex Soviet infrastructure. In this sense, it is “faulty to see the Soviet past as something external that can be easily removed.” In contrast to the Soviet project of creating new men and women, which will produce new material life, “the Ukrainian government thinks new laws can create a new identity, [and it is] a naïve and simplified vision to think you can accomplish this without radical social and economic changes,” Ruban said. Jermolaewa added that in the towns and villages she visited with Ruban, it was interesting how some residents were protective of the remnants of Lenin statues, cleaning and taking care of gone sculptures, “as if his aura were still there.” She added that most of the time people approached her, not the other way around, because it was a big deal for them to speak out on this issue. Echoing Ruban’s assertion, Jermolaewa also noted that these statues were often the place of a first date or kiss for some people—not only political, but also cultural sites. Referring to decommunization as “farce,” Vorotniov showed a news clip from 1990 in which workers in a mining town are toppling a Lenin statue. Aired on the Soviet news program “Vryema” at the time, Vorotniov noted how this act was dangerous back then as no one had an idea the Soviet Union would collapse a year later. This was tragedy, as opposed to decommunization today, which Vorotniov likened to a circus or carnival, functioning as ideological placebo and inspiring an abundance of internet memes. Bazdyrieva said that for her, it was important to separate the Maidan Revolution from its aftermath, because while the former contained multitudes of people from different backgrounds who fought the oligarchy, decommunization repeats history quite strongly and therefore cannot be an attempt to build a new identity. Vorotniov, on the other hand, disagreed that the two could be separated, arguing that a long process of civil society development in Ukraine led to the moment of Maidan. In his opinion, Bazdyrieva’s notion of Maidan as a leaderless movement of different people who “wanted to claim their city” was a romanticized view. Regarding Bluth’s question on the role of art in the revolution, Vorotniov responded that art should ideally have the room and capacity for reflection, but should not merge completely with political developments, to which the artist is secondary: “Art could react to politics, but if it’s useful, then it’s propaganda,” he said. Rossen Djagalov, an Assistant Professor of Russian at NYU, then asked the panelists how one can escape from the logic of the culture war that has dominated the past 25 years of Ukrainian history, exploding in 2014 into a real one. (Djagalov defined culture wars as ritualized aggressions with perfectly predictable responses, which serve to obscure more significant processes in society, such as the upward distribution of wealth.) Acknowledging that the whole process is ironic by nature, Vorotniov said his artistic method was to investigate things in fragments, without any pretension to a bigger battlefield. Bazdyrieva, on the other hand, argued that art’s function is to expose different opinions, like Leninopad does: “This is what we should really invest in so people can see these multiple experiences,” she said. Ruban, in turn, noted that the Ukrainian government was using the arguments of cultural war, which has become the justification for decommunization—the logic in this case is that getting rid of Lenin statues in Ukraine would prevent the spread of war in the east. “Support for Lenin statues or the communist past has been equaled with support for the separatist movement, but it’s false logic, and hides the economic basis of this war and economic problems of Ukrainians,” Ruban argued.